Head over to Amazon and get the Etna Pet Play Pen, Large for just $22.94 – it’s lowest price. Shipping will be FREE with Amazon Prime or an order of $35 or more. 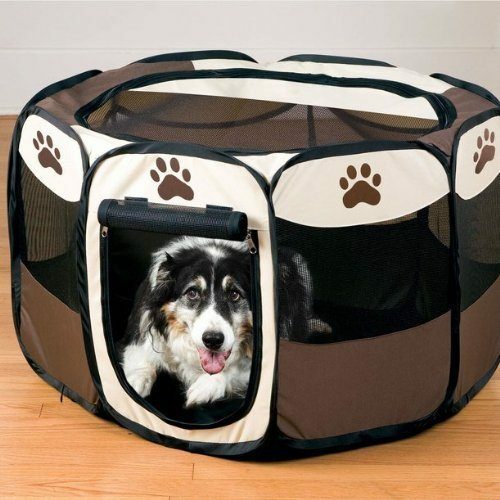 This Portable Pet Play Pen is the perfect way to keep your pet comfortable. Suitable for indoor and outdoor use, the pet play pen provides your dog with shade from the sun’s harmful UV rays. Equipped for all types of weather. The water resistant base allows you to set up the Pet Plan even after a rainy day. Never worry about the pet play pen flying away the built in loops on the base of play pen allow you to securely stake the play pen into the ground. Perfect for indoor use as well, providing your pet with a play area to call their very own. The mesh and polyester material combination creates a pet play pen with the perfect amount of ventilation.